In 2006 TRITEC invented a new service for their big industrial customers. The Supply Chain Management is building interfaces between them an e.g. companies which are incompatible to the standards of a worldwide operating concern. Often these small companies are inventing very innovative and competitive products for the market. Big enterprises need these flexible and quick operating companies but they are mostly not matching their formal requirements in e.g. labeling, packing or certification. TRITEC offers best of both worlds. Skilled, quick, flexible, certified, matching the standards as an A-Supplier for many big companies. 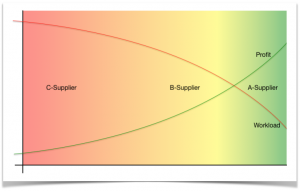 The external Supply Chain Management is a WIN:WIN:WIN concept. The smaller company is able to sell their products, TRITEC gets a small margin for their service and the global operating big enterprise has access to innovative and cost effective goods.